Sue, Wallee, and I were touring Vermont with the Keystone Cops MTFCI group. I took some pictures for your entertainment. Other events that we missed were Melvin's day tour and the Hill climbs in Indiana. You just can't do eveything; although, I sure am giving it my best try. The next newsletter should contain reports on the Melvin's tour and the picnic. Please make a mental note to attend the meeting on the 1st at Bob Torbet's in Lima. This meeting is not at our normal meeting place; so, don't go to Jack's. He won't be there!!! On a more somber note, I'm sad to announce that one of our group has passed away, Paul White of Findlay is now looking down on our activities from above. Please join me in offering our deepest sympathy to Judi White and the rest of the family in this time of loss. Paul was in a tough fight that was just unwinnable. 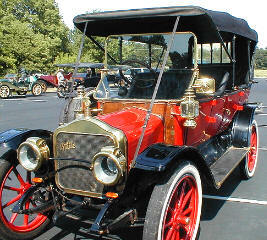 Plan to attend the Old Car Festival at Greenfield Village. 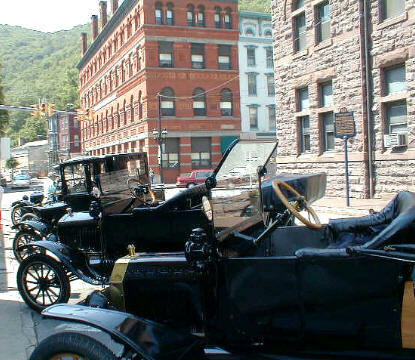 You will see 500 pre-1932 cars that represent the best representation of America in the beginning of the 20th century. The cars are not just sitting there to look at. Participants are encouraged to drive the cars around the Village and participate in events such as pass and review, parades, field events, and class judging. You will not see more early cars in one place. 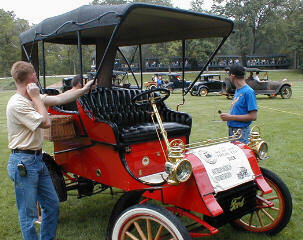 The picture at the right is Rick Linder about to demonstrate the features of the 1903 Model A. Behind him is the starting line for one of the many field events that is open to all participants. They all types of races on the field throughout the day. 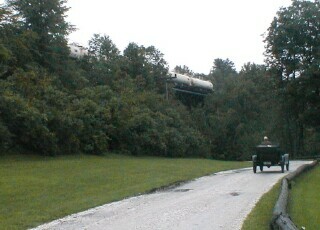 Also visible in the picture is one of the operating steam trains in the village. To the left is we see the replica of Henry Ford's quadricycle. 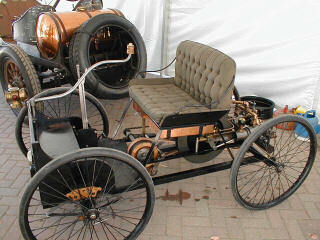 This early car operates and is started during the festival and driven around the village grounds. You can also get a glimps of Number 99, the race car that kept the Ford going in the early days of the company. It is too late to register for the tour at this late date; but, everyone is welcome to come to Logan in the evening or early morning to see all of the cars and talk to some of the folks. Some of them are quite "colorfull". I thought that these cars would be a fitting tribute to Paul's love for the automobile. The pictures were taken at a recent Reliability Tour centered in Tiffin. They represent cars that are not only expertly restored, they are also in perfect running order. Paul was known as a collector of garage space. He also loved to drive the cars when he had the time. Like most of us, Paul never had enough time. We were lucky enough through the years to steal a little of his time on a Wednesday night from time to time and hear his stories of special finds. 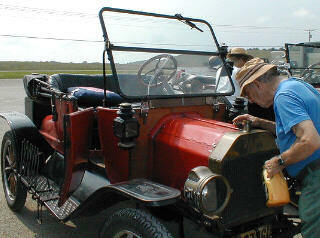 He was a lover not only of the Model T Ford, but also many great autos right up to the present. These picture are a good representation of early touring cars. 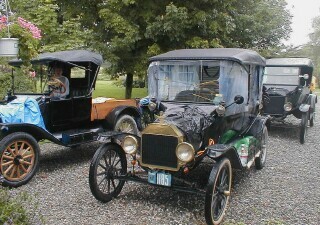 Unlike the Model T, they are very sturdy and luxurious. 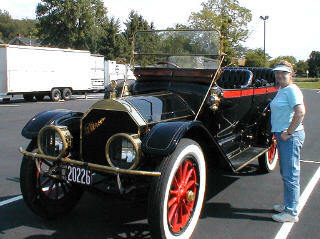 I took the picture of my wife Sue next the the 1911 Pierce Arrow to show just how big these cars were. Sue is 5" 7" tall. This is not trick photography! The car really is that big. The annual Keystone Cops tour this year took place in Middlebury, Vermont. Sue, Wallee, and I were lucky enough to join the group once again this year for a week of touring the Green Mountains. 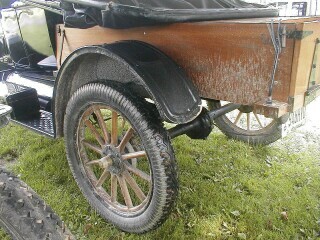 I've just created a little photo gallery here to give everyone a feel of what pushing Model T's is all about. The 14 cars that performed this tour were all good runners and had very little problems until Saturday when the skys opened up and didn't quit until after noon. 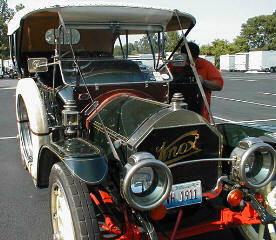 This 1915 was driven by a couple of brothers from PA. They had a great way of keeping the inside of the car dry. Old Henry displays some of the aquired road dirt from the 70% gravel road day. It was sometimes a trick to keep the T going straight down the road. 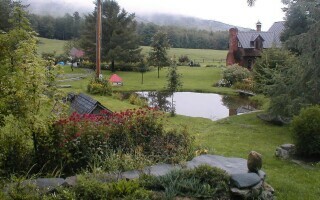 The Saturday destination was beautiful country home set up on the hills leading to a summit called the camels hump. Not all of the cars made it to this point unassisted. Brad learned about the thrill of wet Rocky Mountain brakes as he had trouble on the way. To the left is my favorite part of the tour. Our campgrounds was right underneath the main line of the Vermont Railway. Don Buesing (in his car) raced to this spot to see the train on a couple of occasions.